The early days of commercial theatre involved performances in public spaces such as town squares. Acting troupes travelled the country and sought lodgings at inns or taverns. 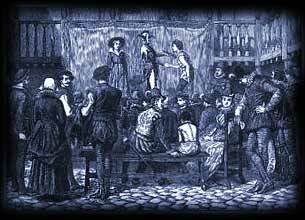 The natural progression for the troupes was to negotiate with the tavern owner, or vintner, in order to stage a performance at the inn. All parties would therefore benefit. The larger the audience, the more profits were made. 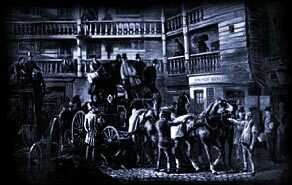 In the Elizabethan days the usual form of transport was on horseback, so all of the major inns had large cobblestone yards. The obvious progression was to stage the plays in the inn-yards. The inn-yards were surrounded by balconies to the rooms which provided lodgings for travellers. A fee was charged to playgoers for entering the inn-yard, and then an additional fee was added on if they wanted to go up to a balcony level. In 1574 the City of London started regulating the Inn-yard activities which lead to the development of the covered Playhouses and the open amphi-theaters.